Thoreau is committed to providing support to our families affected by the government shutdown. We have already welcomed federal employees into our building who are serving as FCPS substitute teachers which is a daily need at our school. In addition, lunch will be provided to all of our students regardless of ability to pay or temporary financial circumstances; at Thoreau, there will be no "lunch shaming." Furthermore, if your family is experiencing financial difficulties, please contact Thoreau director of student services Rebecca Aguilar at rjaguilar1@fcps.edu or 703-846-8012 so her office can help get you connected to community-based services and resources. If you would like financial support with upcoming field trips or other school-related expenses, please let Mrs. Aguilar know that in your message to her. We will do what we reasonably can to lend a helping hand to our impacted Thoreau families during this difficult time. 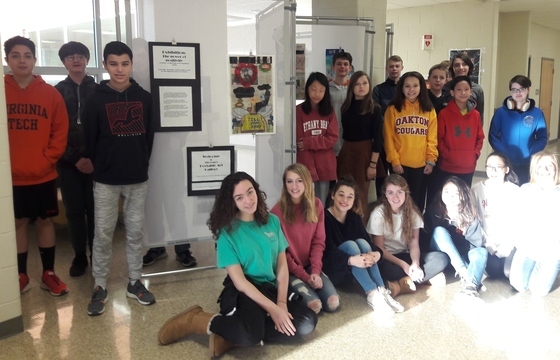 Creative writing classes of Ms. Kownacki and Ms. Cain held a Creative Writing Gallery during the week of January 7th. Each student had two entries: a non-fiction writing piece and a poem. During the gallery, students participated by creating awards for three poems in a variety of categories and completing a scavenger hunt looking for information in the non-fiction pieces. Counselors from Madison and Oakton High Schools have already visited Thoreau to kick-off the transition to 9th grade. Marshall HS counselors will visit Thoreau on Thursday, January 31st with a snow date of Friday, February 1st. Students need to return course selection sheets to their 8th grade science teachers. Thoreau counselors will meet with students individually to discuss course options and placements throughout the months of January and February. Thoreau counselors will conduct course presentations in mid-February, and will continue to work with our rising 8th grade students and families through mid-March to complete this process. Thoreau Activities Fair for rising 7th grade students is Tuesday, February 5th and Wednesday, February 6th from 10:00 AM - 12:00 PM. Students are transported to Thoreau from our feeder elementary schools for this event. For AM and PM Kiss-and-Ride, please note that the Church for All Nations is not available as a drop-off/pick-up location for Thoreau students. This is not FCPS property and they consider it trespassing. The Thoreau Administration appreciates your cooperation in being respectful of our neighbors. 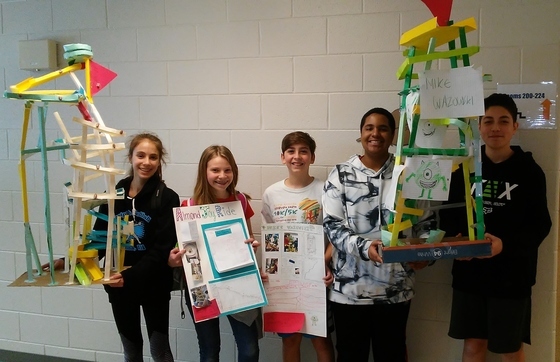 8th grade students in Ms. Jacobs' 6th period science class created models to study Newton's Three Laws of Motion. FCPS is participating in Speak Up, a national online survey about the use of technology in schools. The information collected from the survey will help policymakers at the local, state, and national levels, as well as the business community, contribute to the national dialogue about science and technology, and preparing students for the 21st century workforce. FCPS will be participating in the survey through Thursday, January 31st. The online survey is open to parents, K-12 students, teachers, and staff. It is an optional survey and takes approximately 20 minutes to complete. All responses are confidential. We encourage everyone to participate in the survey. Please visit this link to take the survey. For more information about the survey, visit this link. Our annual Crosstown Hoops basketball event versus Kilmer MS will take place on Thursday, April 4th, from 5:30 PM - 9:00 PM at Marshall HS. We will host an interest meeting on Wednesday, February 6th, after-school during session 1 (2:25 PM - 3:10 PM). The snow date is Thursday, February 14th. All students who are interested in trying out for the teams should plan on attending to get important tryout and event information. If you are interested in trying out, but cannot make it to the interest meeting, you must see after-school specialist Shannon Campbell prior to the meeting. The girls interest meeting will be in the library. The boys interest meeting will be in Eagle Hall. The Thoreau after-school program is partnering with Capital One again this spring to bring an exciting enrichment opportunity to our students. The initiative is a 10-week program designed to teach middle school-aged students introductory software development skills in a fun and engaging environment. Most excitingly, students create working mobile apps that they can share with their friends and family! This activity will meet on Thursdays from February 21st - May 2nd (with the exception of Thursday, April 18th). The program will run from 2:25 PM - 4:05 PM. Students will be able to take a late bus home. The program will conclude with a celebration event and App Challenge at Capital One headquarters in McLean on Thursday, May 16th at 6:00 PM. Due to the popularity of this program and limited spaces, a lottery system will be used to determine the students who will participate. Applications of students who can commit to attending all 10 sessions will be given priority. Students who previously participated in this program are not eligible to participate again. Applications are available in the school's main office and on the Thoreau activities site on Blackboard (FCPS 24/7). Students should complete the application and return it to the school's main office or Thoreau after-school specialist Shannon Campbell no later than Friday, February 1st. Students will receive notification of acceptance on Monday, February 11th. With a generous grant donation from the Thoreau PTA, art teacher Lori Eshbaugh created a portable art gallery space. The first exhibit, currently on display, showcases the work of art extensions students and features The "Power of Positivity." This exhibit takes a look at the news and its often negative stance. Students transformed various front page editions of The Washington Post into more positive news stories. They are displayed to spread the power of positivity! Thoreau's after-school program partners with Vienna Teen Center's Club Phoenix to offer programming at Thoreau. One service that we are looking at potentially offering is a shuttle bus that would transport students from Thoreau to the Teen Center ar the end of the afternoon, two days a week. Only students who participate in Thoreau's after-school program and are registered with Club Phoenix would be able to use this service. The students would then be able to participate in Club Phoenix activities until the center closes at 6:30 PM. Club Phoenix is a drop-in program, and participants may only sign-out once daily. Students will need a mode of transportation home from the center. The registration form is available at the Teen Center or you can email Teen Center program manager Natalie Duncan at Natalie.Duncan@ViennaVa.gov. Please fill out this survey so we can gauge parent/student interest in this service. There would be limited space on the shuttle so students would need to register in advance. The survey will close on Friday, February 1st. Survey results will be used to determine a schedule. Note that the shuttle would only run on days in which the after-school program convenes. 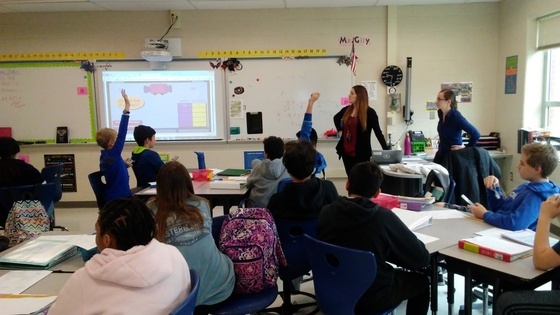 Math teachers Samantha Guy and Janessa Torrey's 8th period math students were introduced to identifying proportional and additive relationships using the Magic Function Machine. 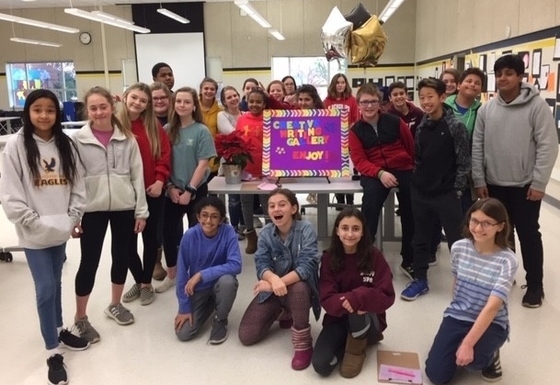 Thoreau's PTA Hospitality Committee thanks all who generously helped with hospitality events in 2018. The committee is kicking off the new year with a "Souper Bowl" luncheon for our wonderful teachers and staff on Thursday, January 31st. With your help, we will provide a super healthy soup and salad bar. If you can donate food or time for this special event, please sign up here. Spirit Wear orders placed during our winter campaign are ready for pick-up at the Thoreau School Store. The store is open Tuesdays, Thursdays and Fridays from 10:30 AM - 1:00 PM in the school cafeteria. If you have not yet done so, please ask your child to stop by the store at lunchtime to pick-up your order this week. Registration is open for the Thoreau Spelling Bee which will be held Tuesday, February 19th at 6:30 PM. The spelling bee offers students an opportunity to improve their vocabulary, build verbal confidence, and be part of a school tradition. The Thoreau champion will go on to compete with other regional champions in the Fairfax County Spelling Bee. Word study lists, rules, and program info are provided via email after a student registers for the bee. To register your child by the Friday, February 15th deadline, sign-up here.